Two nurses from the University Hospital of Wales have been recognised as ‘Beacons of Hope’ by the Lymphoma Association because of their dedication to supporting people affected by lymphoma, the UK’s fifth most common cancer. 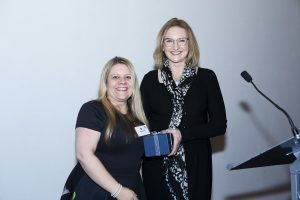 Sara Busby, a senior staff nurse on the young adult cancer day unit, won her award for her commitment to supporting young adult Hodgkin lymphoma patients. Deputy sister of the Out Patients Department Vivienne Hayes was nominated by a colleague who wrote that Sister Vivienne has ‘made a real impact on the lives of people living with lymphoma in Cardiff’ by starting a campaign called ‘Every Contact Counts’ – every contact she has with patients she imparts health and lifestyle advice. 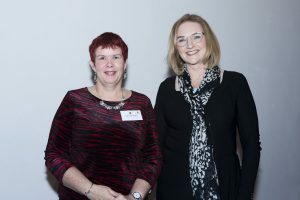 Sara and Vivienne received their Beacons of Hope Awards from the national cancer charity at a ceremony that took place in Birmingham earlier this month. ‘Not only is Sara a true advocate for her patient group, she also promotes lymphoma awareness generally – to staff, patients and students alike. She works tirelessly to ensure lymphoma awareness initiatives are adopted on the unit. ‘Patients have responded really well to the Every Contact Counts campaign and always say to me that they are impressed with Viv’s attitude and devotion to her work. Her work reinforces the advice we impart in clinics and follows through the theme of healthy lifestyle choices for people living with lymphoma. ‘Sister Viv has also worked tirelessly with the lymphoma team in Cardiff to help us reorganise our clinics to provide a more streamlined service. Her help and insight have been a benefit to us all. Jonathan Pearce, chief executive of the Lymphoma Association, said, ‘We were delighted to be able to present Sara and Vivienne with a Beacons of Hope Award. Around 125,000 people are currently living with lymphoma. It is also the UK’s fifth most common cancer and the most common cancer in under 30s.